Raven lives in “Dullsville” where nothing ever happens…Until now. The mansion on top of Benson Hill has been empty and boarded up for years. But a new family has moved in. A family that never ventures out during the day. Who are these creepy people—especially the handsome, dark, and elusive Alexander Sterling? Or rather, what are they? Could the town gossip possibly be true? Are they vampires? 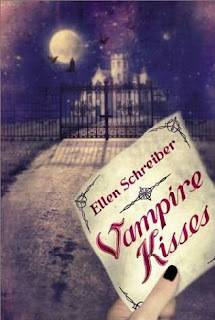 In this light, enjoyable read, Ellen Schreiber reinvents the classic vampire in Alexander. He can’t go out in the sunlight, he has an aversion to garlic, and he has no reflection. But he is also almost human in the way he acts towards Raven, and in his emotions. He’s an extremely talented artist with soulful black eyes and a loving, almost vulnerable air to him. Much different than your average “Edward Cullen” vampire. This book is full of cookie-cutter stereotypes. You have your meek best friend/sidekick; the popular jock who acts snarky and rude, but secretly is in love with the protagonist; creepy butler who looks almost skeletal and has a name like Jameson; and of course your typical Goth Girl—combat boots, an affinity for black, and a love of vampires. She immediately falls for her “Gothic Guy” (did NOT see that one coming) and he is smitten with her as well. But for all is predictability, I enjoyed this book more than most of the others in its genre. It was funny and just an all around amazing read. 5 stars.